I am SO excited to share this project with y'all today. This may just be one of my all-time favorite ideas to date. 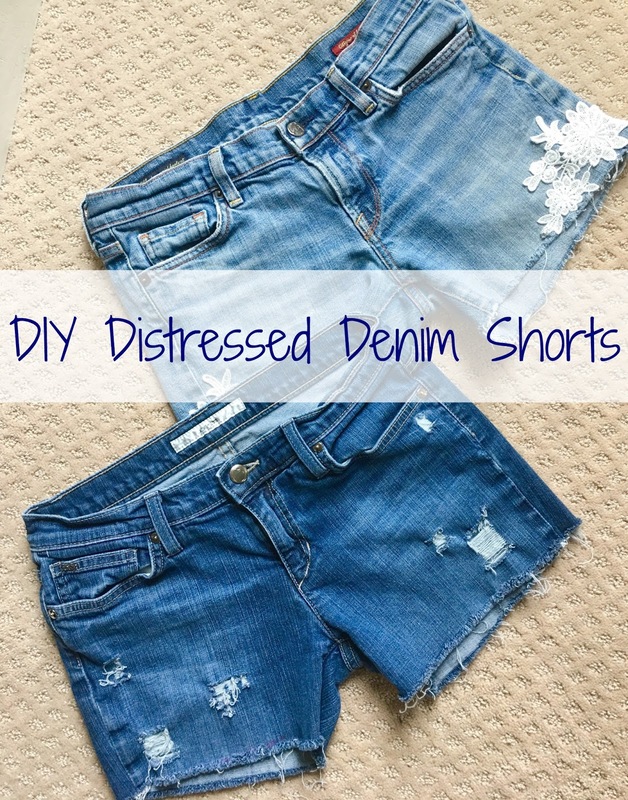 Today I'm sharing my DIY distressed denim shorts! I shared a little about the beginning of the process on our Instagram Stories and had more questions and comments than ever before! Today I'm sharing the how-to if you want to try this yourself and I promise you can do it! It just takes a little time, but very little effort, but anyone can do it! 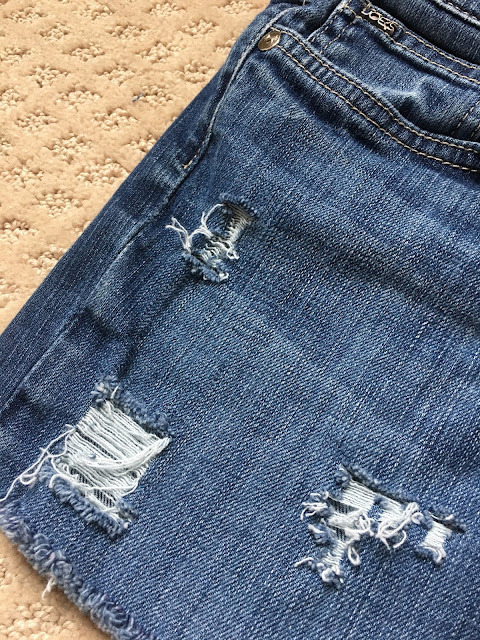 I haven't own denim shorts in almost 15 years and I blame it all on the Florida Gators. Not really, but here's a little history. I went to the University of Georgia and when I was in school us Dawgs loved to poke fun of Florida fans who were, at the time, known for their love of jean shorts, aka JORTS. Heck, for all I know they still may love sporting their jorts and I swear because of this no self-respecting UGA fan would wear jean shorts. However, times have changed and like Jen said to me, we are driving the Kool-aide. The hot summer trend is distressed denim shorts, so distressed denim shorts is what we'll be wearing. 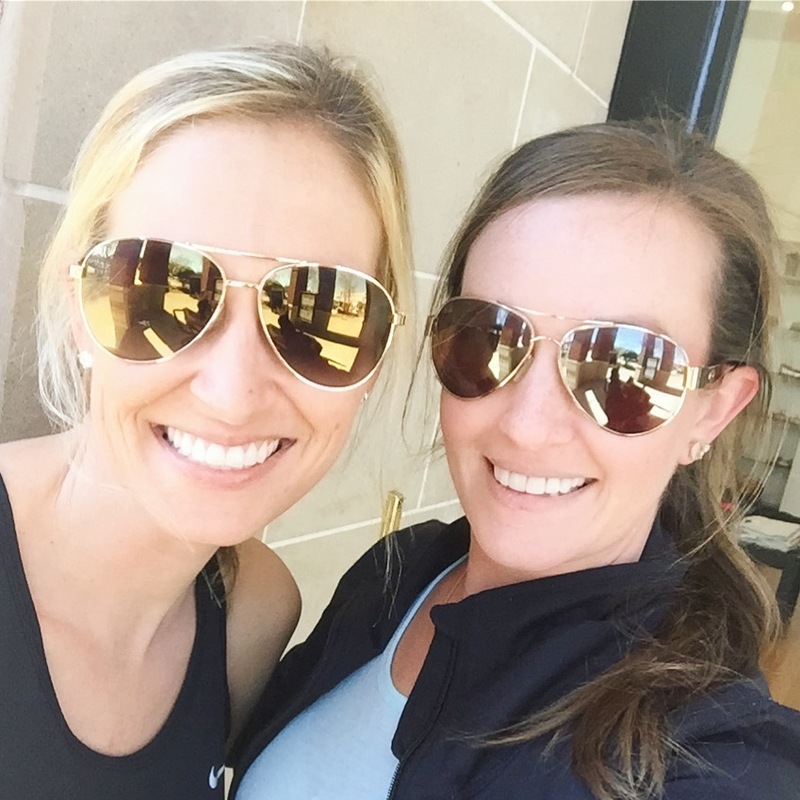 A few weeks ago Jen and I met for lunch and did a little shopping to celebrate her birthday. 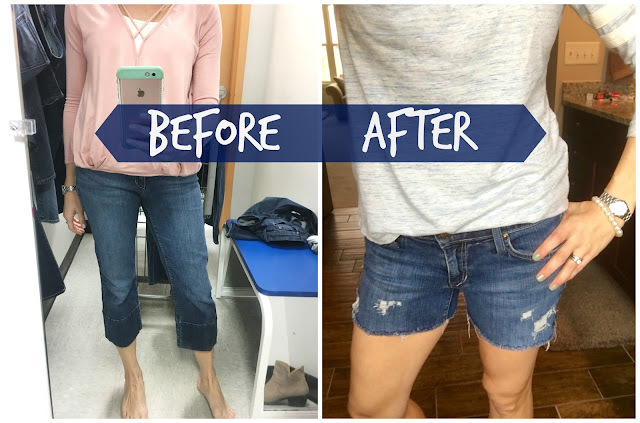 We were hunting for the perfect denim shorts. We found a few pairs at Gap, Loft and J.Crew, but then got a wild idea that we could make our own. We stopped right in the middle of our shopping, searched YouTube for a tutorial video and decided this was definitely something we could tackle. 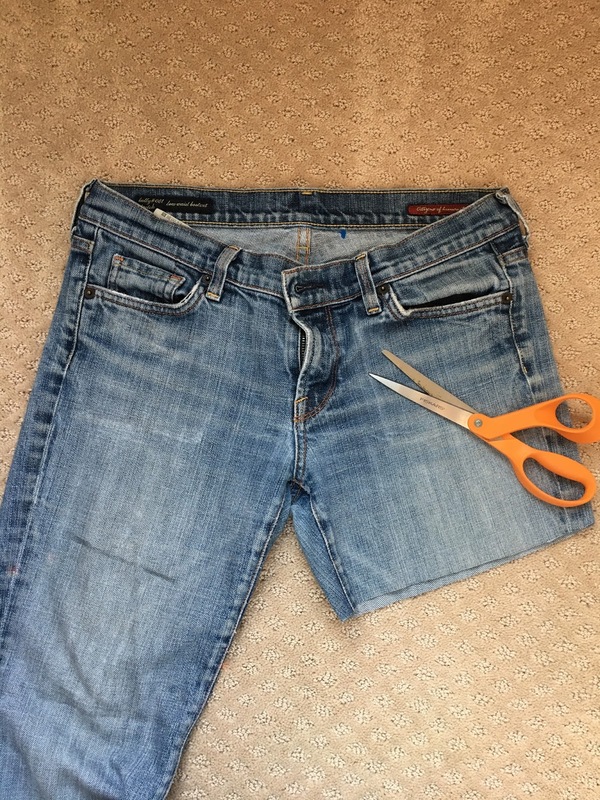 When I went home that afternoon I tried on some of my old jeans, but they were all more of a skinny jean and wouldn't really work for this project. Then I got an idea to check out my local Goodwill, which I just LOVE. Say what you will, but I have found some amazing things there for next to nothing! 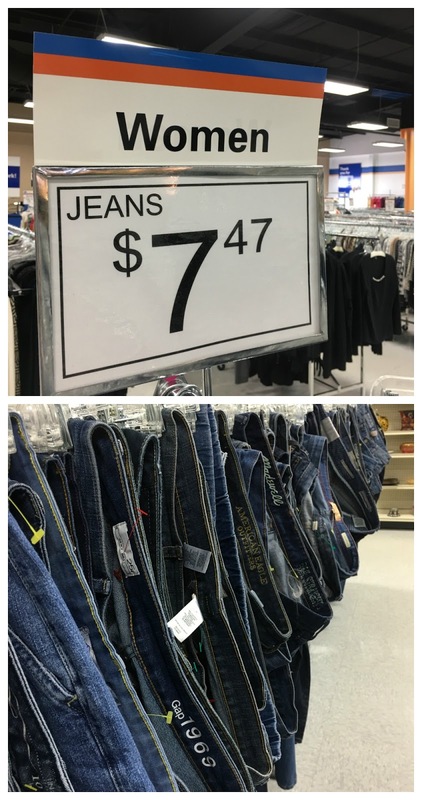 Lots of name brand things for dirt cheap and I hoped I could find some great jeans for this project. My only problem was finding too many! 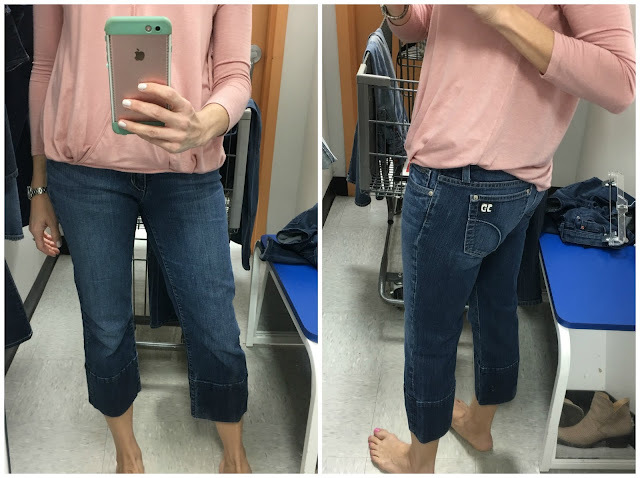 I thought I might find some Gap or Old Navy jeans to use, but instead I found tons and tons of designer denim. Joes Jeans, Citizens of Humanity, 7 For All Mankind and more! I tried on a bunch of pairs and ultimately bought two of them to bring home for this project. One was a capri length pair of Joe's and the other was a faded bootcut pair of Citizens of Humanity. I also found a cute baseball print for Boo-Boo's room and my grand total was $20 even. I couldn't believe it! I picked a pair of shorts that I liked the length of and used those as a guide to start my cutting. I figured I would start longer and could always cut off more. 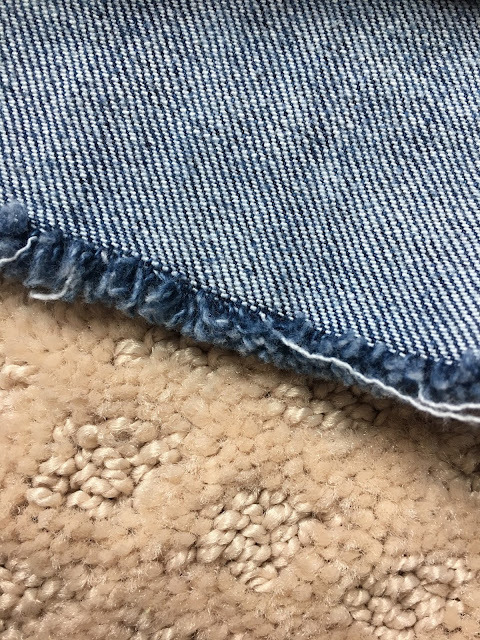 After cutting one side I fold them in half and cut the other so that they would match. Then I tried them on and decided I wanted to go a little shorter...I don't do all those lunges and leg lifts for nothing! I used a marker to mark where I was going to cut, but if I did it again I would use chalk so it could easily wash off. 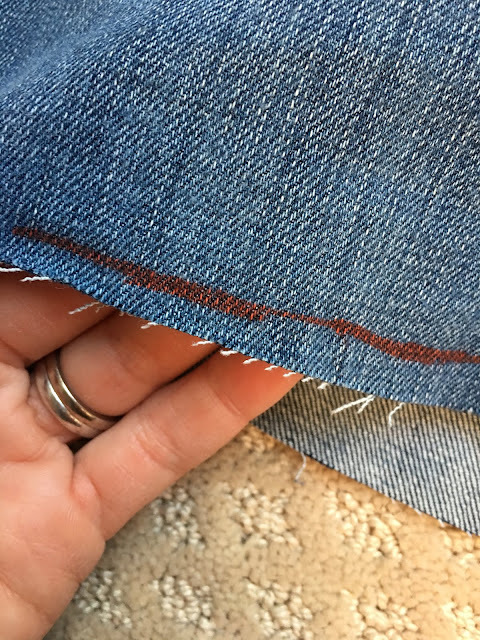 Next I started to fray the ends of the shorts by first pulling on the white threads. 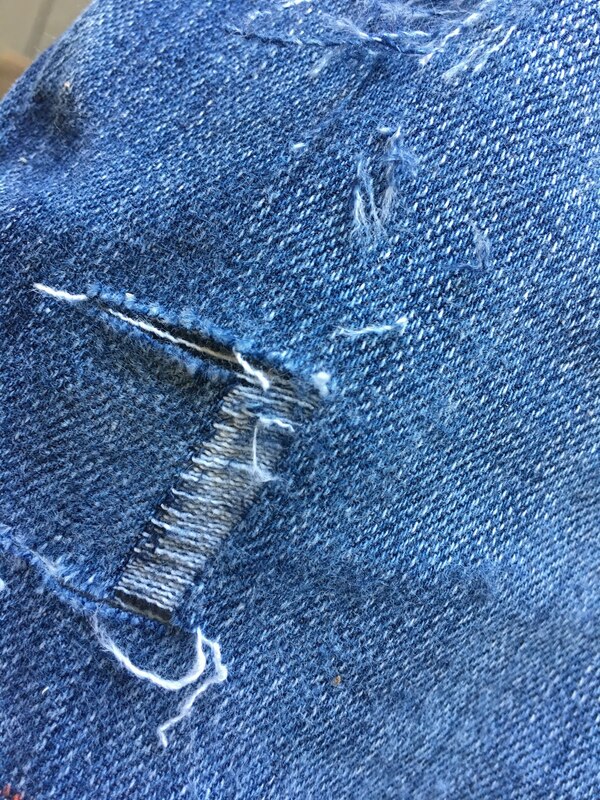 That started the fraying process and then I threw them in the washing machine and dryer to help them fray a little more. 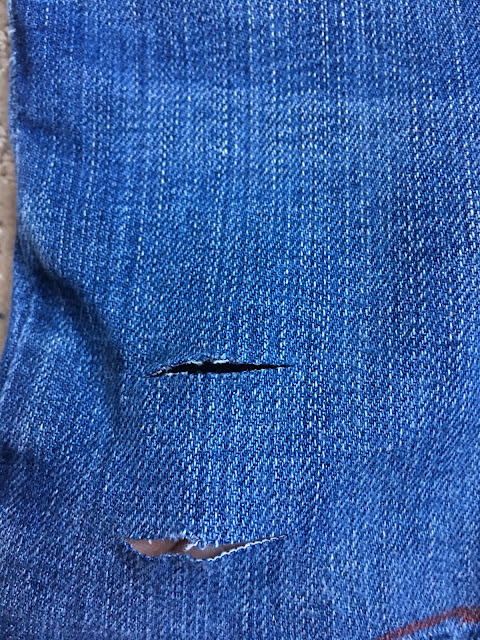 After they came out of the dryer I flipped my shorts inside out and used my tweezers to continue pulling the white threads out until I got the right amount of fray that I was hoping for. Next it was time for the distressing part. This is where a few YouTube tutorials came into play. It's so easy to do though! First, decide where you want your distressing to take place. I looked online at several pictures to get an idea. I wanted them distressed, but not destroyed, so I started small. I cut two slits, both about an inch wide. 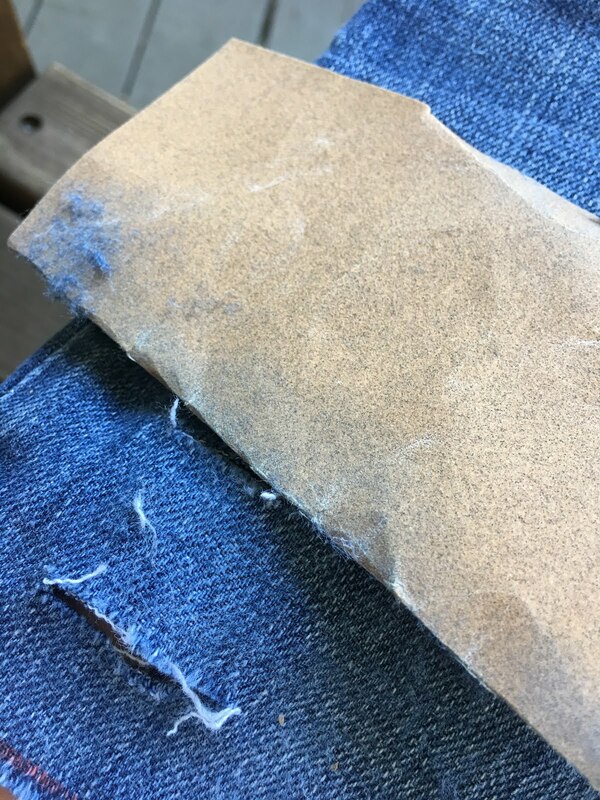 Then I used sandpaper to rub over the area that was cut to help loosen the weaving of the denim. 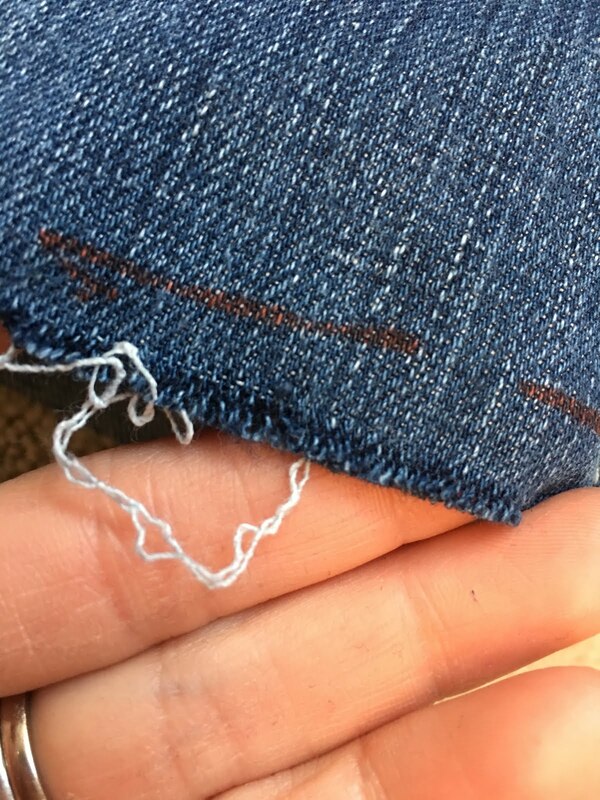 Next I used my tweezers to pull on the blue threads of the middle section that was cut. 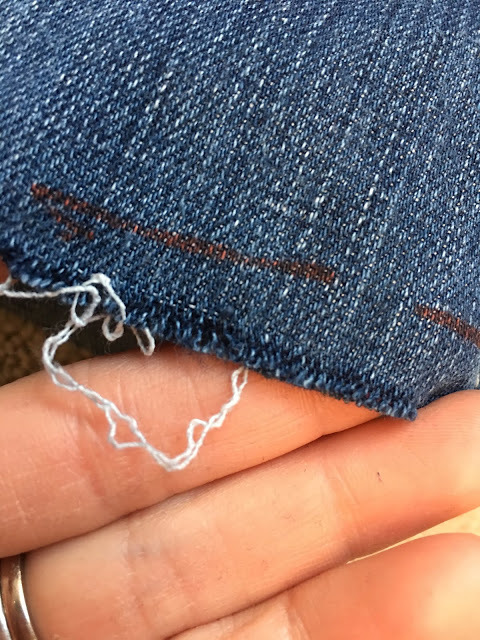 Pull on the blue threads until they come loose and continue until you've pulled them all out, leaving only the white threads. 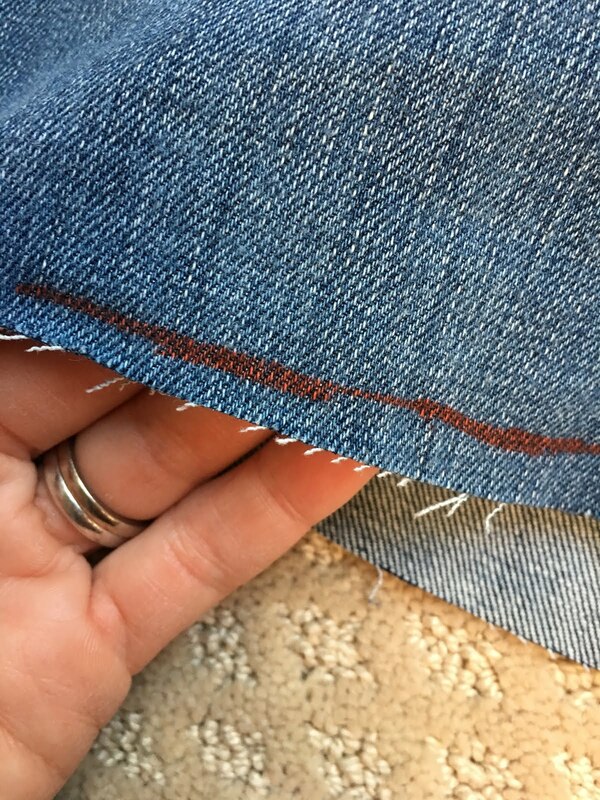 I continued doing this in several areas on the shorts and on the pockets on the back. Then I washed and dried the shorts again to help give them a worn look. At this point my shorts were done! I cut off some of the white threads that were hanging on the bottom of the shorts, but that was it. 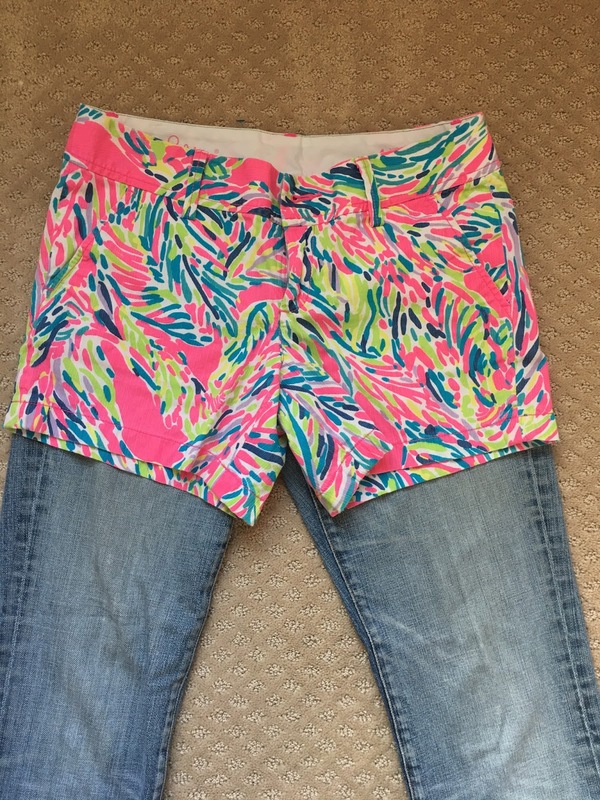 I loved how they turned out and can't wait to wear them this spring and summer. 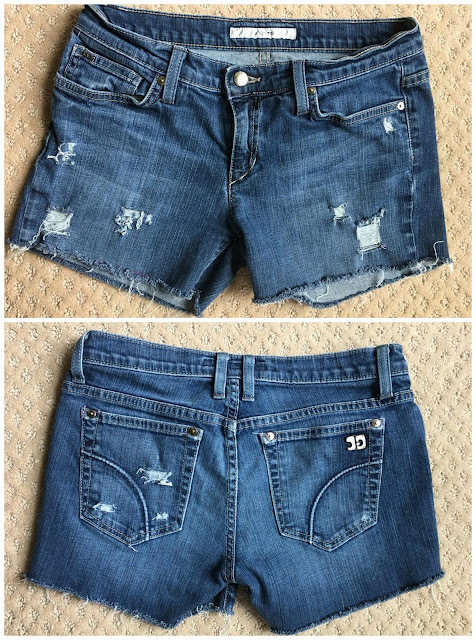 And besides investing a little bit of time, I have designer denim shorts for less than $7.50!!! From capris that were out of style to trendy distressed shorts...love this transformation! 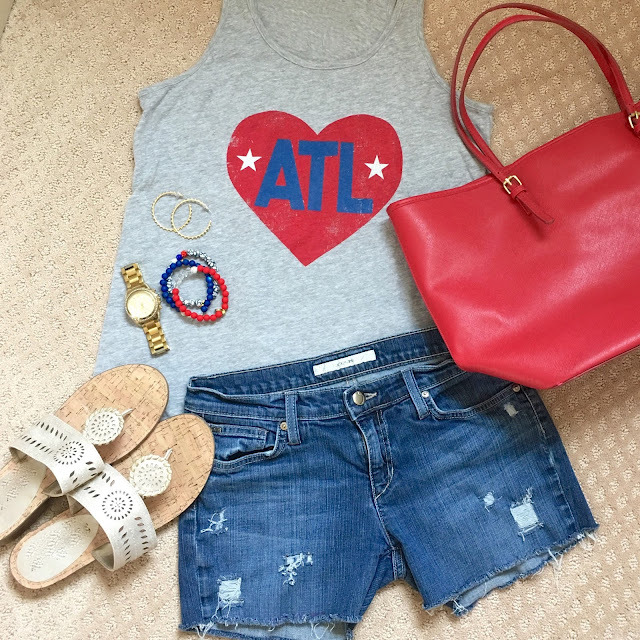 I can't wait for warm weather so I can pair them with my favorite sandals and this totally awesome ATL tank I found at Target last week!!! I have mad love for my hometown and this outfit will be on repeat all summer long. Now for my next pair I decided I wanted to try a little something different. 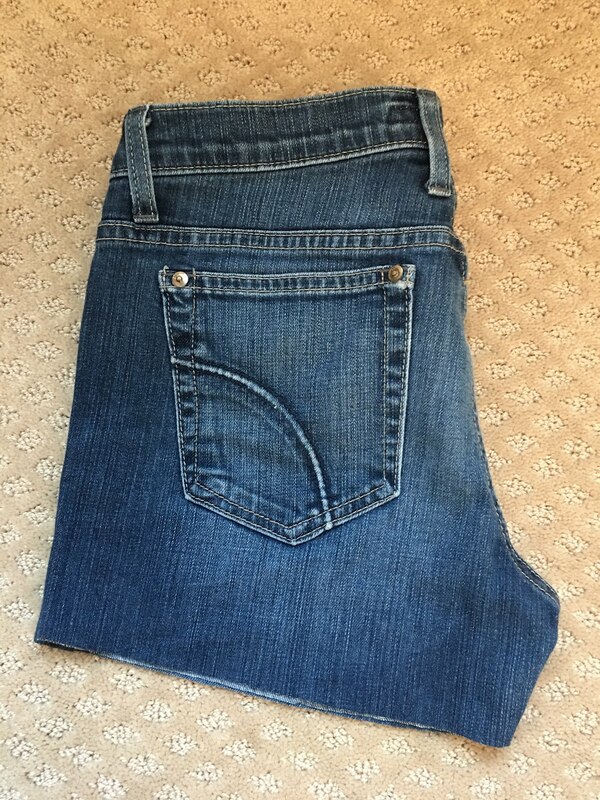 Little Mama has THIS pair of denim shorts I bought for her a few weeks ago. 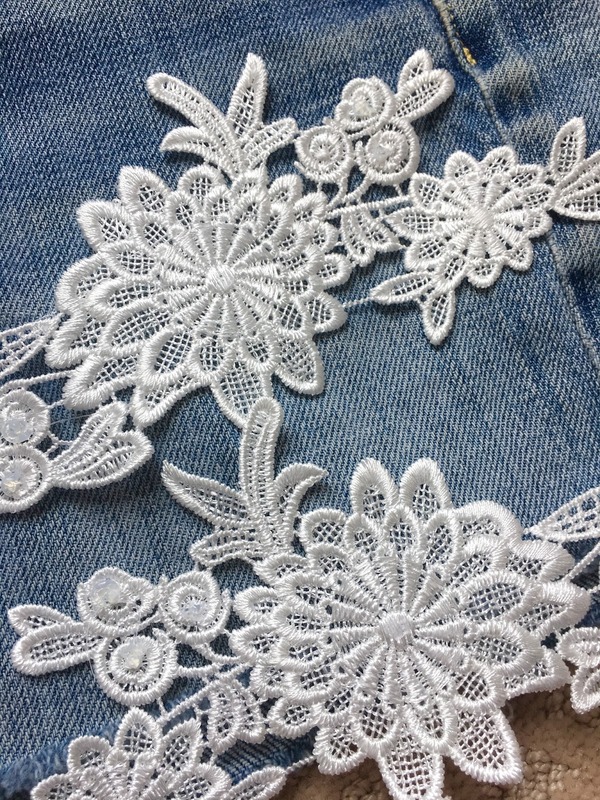 I just adore the lace/crochet detail on them. Super trendy and super girly so I wanted to see if I could create something similar for myself. When I was at Hobby Lobby (my favorite place ever) earlier this week, I asked the sweet ladies in the fabric and sewing department if they had anything like this that would work. I was hoping for an appliqué or something, but I came up short. 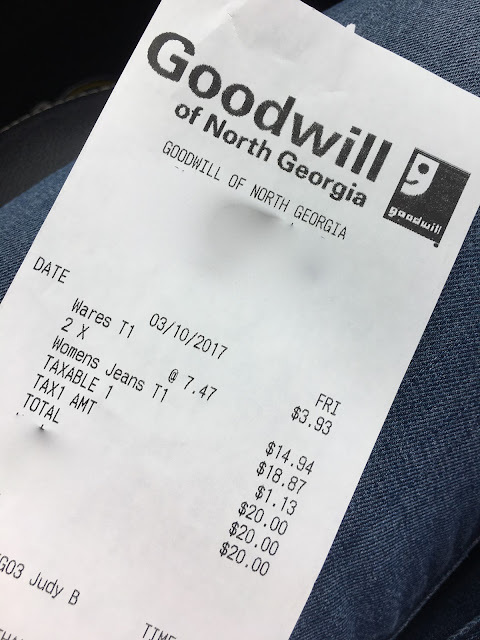 The woman working there suggested I look at Goodwill for an old table cloth that I could cut and use. That just made me giggle. 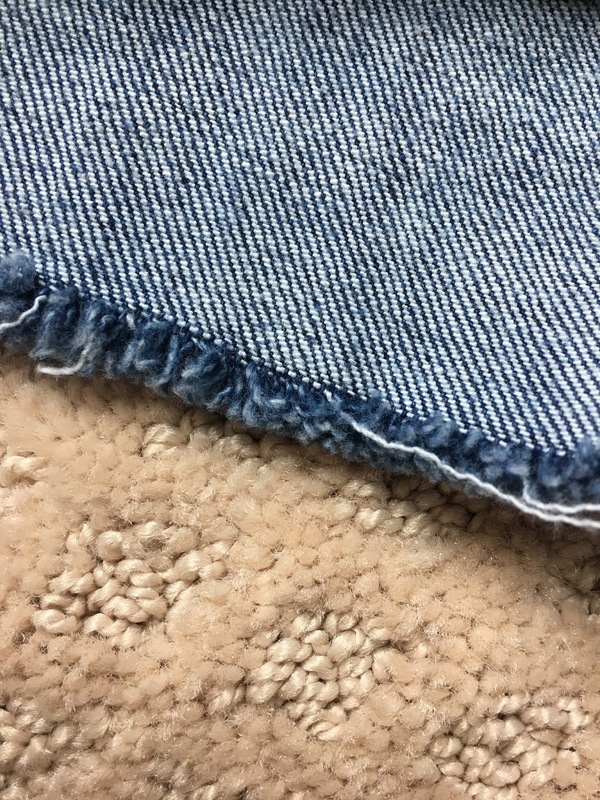 Little did she know I was going to be using this on my Goodwill jeans! I browsed a few aisles in different departments and found these crocheted headbands for $4 each. 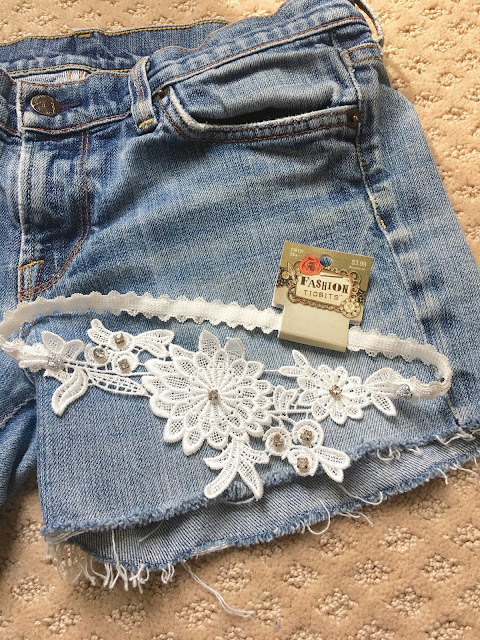 I bought two in hopes that I could cut off the elastic headband part to use the pretty lace part for my shorts. 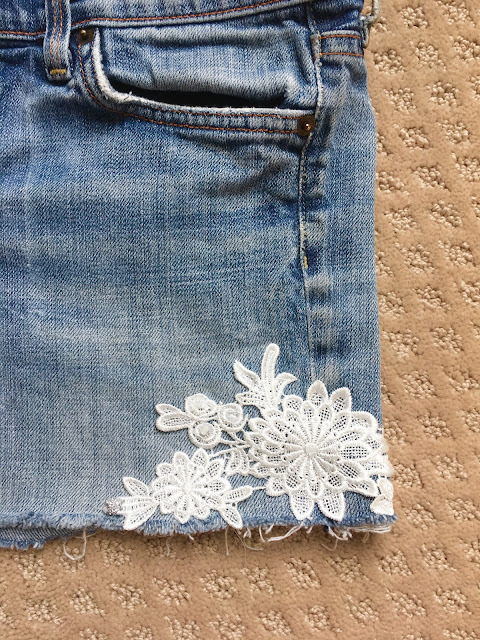 I picked off the rhinestones, which were just glued on, and then stitched the flowers onto the side seams of the shorts using my sewing machine. 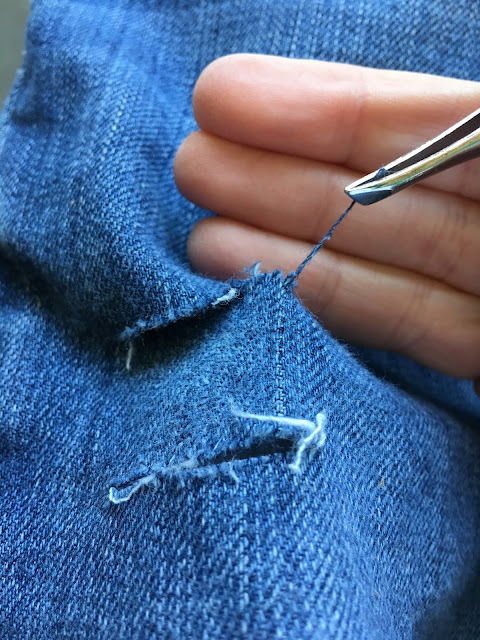 However, this could easily be done by hand or even just glued with fabric glue, too. They turned out SO cute! 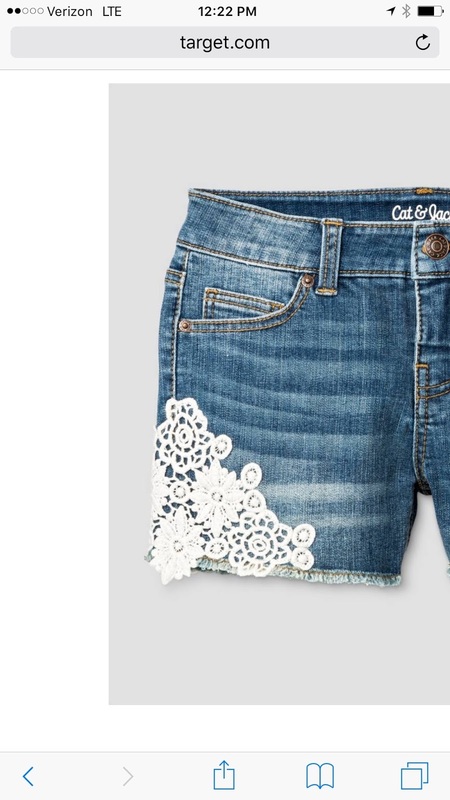 I really love the crochet details and know I am going to be wearing these over and over this summer. When I picked up the ATL shirt I also saw this one. 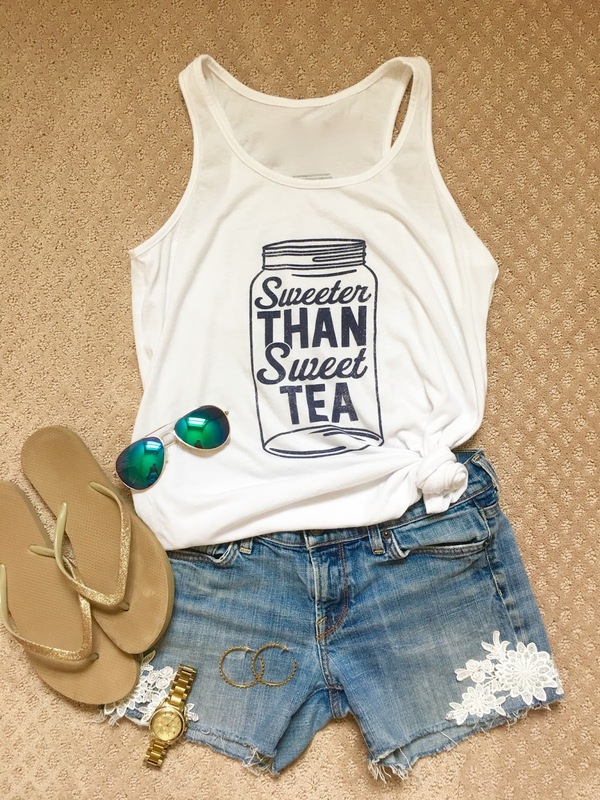 Anyone that knows me well knows I LOVE sweet tea. I was shopping with Blondie on this day and she insisted that I get this tank. All they had left was a large, but I tried it on and actually like the looser fit and will just wear a cami under it. Plus, I think it's fun knotted up anyway. I was so surprised and impressed with Target and their local pride selections. Lots of fun ones for Atlanta (see them all HERE) and they have lots of options for so many different cities. If you love your city, be sure to check a Target near you for local options or you can see them all online HERE. 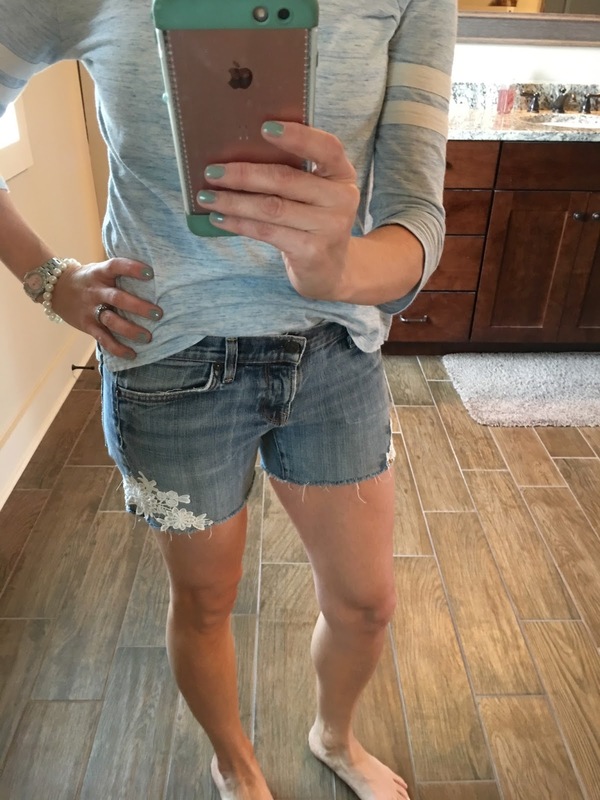 I can tell you know that denim shorts, a cute tank, flip-flops and sunnies will end up being my go-to uniform all summer long. If you give this project a go I would love to know! Please be sure to share and let us know how it turns out! I can't even get over how perfect these turned out!! And how much i desperately wish I lived closer so you could help me make a pair!!!! You can make your own!!! I'm telling you it was SO easy!! !